Trust is a central feature of relationships within the Mafia, oppressed minorities, kin groups everywhere, among dissidents, nationalist freedom fighters, ethnic tourists, ethnic middlemen, exchange networks of Kalahari Bushmen, and families subjected to Stalinist social control. Each of these types of trust is examined by a leading scholar and compared with the expectations of neo-Darwinian theory, in particular the theories of kin selection and ethnic nepotism. The result is a fascinating, theoretically focused yet empirically eclectic contribution to the overlapping fields of human ethnology, evolutionary psychology, and bio-politics. The common thread uniting these diverse phenomena is a trusting relationship predicated on altruism. 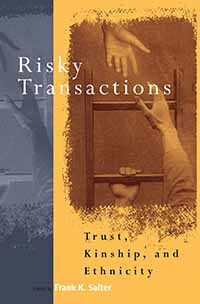 Chapters examine the strengths and limits of human trust under various stressers and temptations to defect. By exploring the relationship between kin and ethnic altruism and showing its sensitivity to culture, Risky Transactions recasts the evolutionary approach to ethnicity as a blend of primordial and instrumental factors.